During our brew day we add the various salts measured in the previous steps to the mash and to the boil, and make other water adjustments. For sake of completeness, below is a summary of the water adjustment steps we follow, some taken from our Brew Day: Step by Step guide and Parts List for Using Your Brewery. We add this potassium metabisulphite directly to the Hot Liquor Tank after filling it with water at the start of the brew day. The chemical reaction is instantaneous, no waiting required. Some brewers choose to use activated carbon based water filters to remove chlorine. Carbon based filters remove less chlorine as they become saturated, and the amount removed is directly related to the speed at which the water is passed through the filter making it difficult to know if the chlorine has been removed. This is why we use potassium metabisulphite instead. It's quick, dirt cheap, and works almost instantaneously. Activated carbon filters are also not overly effective at removing chloramine from water, requiring a more advanced reverse osmosis filtration system. 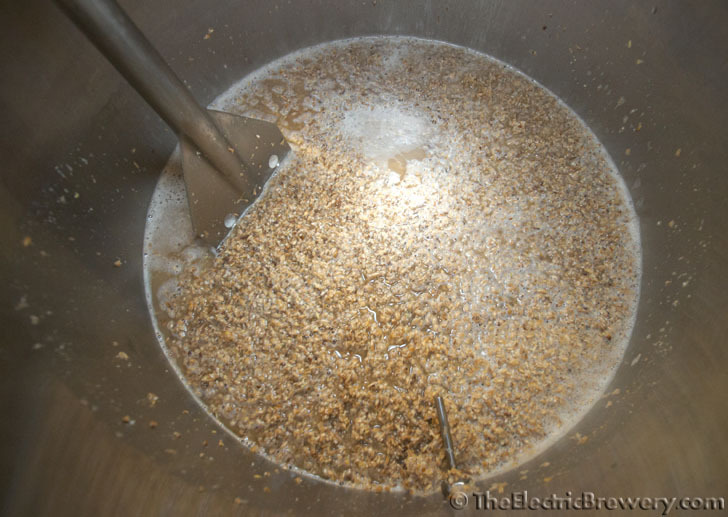 When it's time to add the milled grain to the heated water in the Mash/Lauter Tun, add the mash salts at the same time and mix well with the mash paddle. Remember that the mash salts we've added are primarily for flavour. Once well mixed and left for at least 10 minutes, we also need to confirm the mash pH. Most city water has a pH of 7.0 or higher but the pH range we want for our mash for optimal starch to sugar conversion is considerably lower. Fortunately the grains we mix with the water in the Mash/Lauter Tun are acidic (the darker the grain the more acidic it is) as are some of the mash salts we add. This helps to drive the pH down towards the proper range. We'll now check and add some extra acid if the pH isn't low enough. Once the grains and mash salts are well mixed, take a pH reading by placing the probe tip of the pH meter directly in the mash. The pH meter we recommend has automatic temperature compensation (ATC) up to 140F so we do not worry about cooling down a sample as any errors introduced will be minimal as we usually measure the mash pH when the temperature is just slightly above 140F. While the probe electrode will last longer if the sample is first cooled to room temperature, ours (so far) has last 10 years when brewing once or twice a month, so we've never bothered cooling down a sample as it's much quicker. Feel free to cool a sample to room temperature if you prefer. The most common problem brewers face with a light coloured beer such as our Blonde Ale is that the mash pH will be too high. 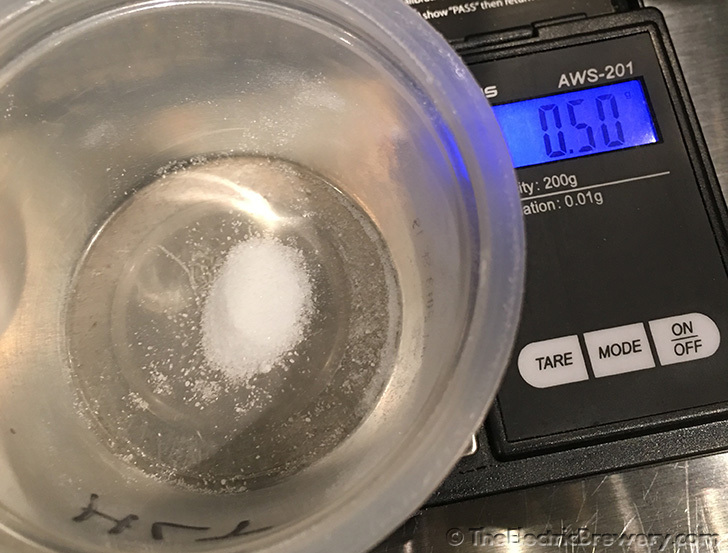 If your pH is above the 5.2 to 5.4 range (when measured at mash temperature), add some 88% lactic acid half a milliliter (mL) at a time using a 1mL (1 cc) syringe, stir well and wait for at least 5-10 minutes, and re-measure until you get close to 5.2 (when measured at mash temperature). It usually only takes one or two milliliters at most for most beers if you were able to hit the proper mineral flavour profile in the previous steps. Some people chose to use 10% phosphoric acid instead of 88% lactic acid as they say it cannot be tasted as easily as lactic acid. This is not an issue as lactic acid in the quantities we use (0.1-0.2 mL per gallon) simply cannot be tasted even in the lightest of beers. You need at least 10 times the amount before it becomes noticeable. Some also say that phosphoric acid will precipitate calcium out solution which could throw brewing salt additions out of whack but they are only very miniscule/irrelevant amounts that will not affect the final beer. We choose to use 88% lactic acid as it works well for us. Feel free however to use whatever acid you like. Some other acids commonly used in brewing also include sulphuric and citric acid. If you prefer to brew to Reinheitsgebot (German Beer Purity Law) standards where acids cannot be used, you may replace a small amount of the base malt with acidulated malt which contains a small proportion (usually 1-2% by weight) of lactic acid. How much is done mostly through trial and error as you brew repeat batches, as adding more will throw off your starting gravity since adding grain adds sugar. We find it simpler to add acid separately. Before we sparge (rinse the sugars from the grain using the sparge water in the Hot Liquor Tank) we want to ensure that the pH of the water isn't too high. Too high of a pH can extract excess tannins from the grain husks. While all beer will have some tannins, with most beers (including this one) we want to try and minimize the amount. Tannins have a tongue-drying astringent taste like over steeped tea or strong red wine. We want the sparge water pH to be below 6.0 (when measured at mash temperature), preferably in the 5.6 to 5.8 range. 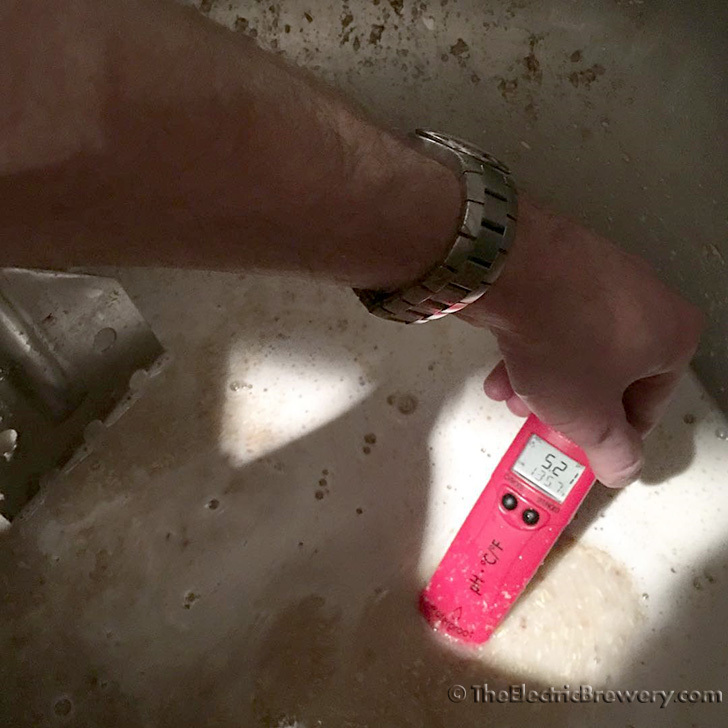 Before sparging take a pH reading by placing the probe tip of the pH meter in the Hot Liquor Tank . 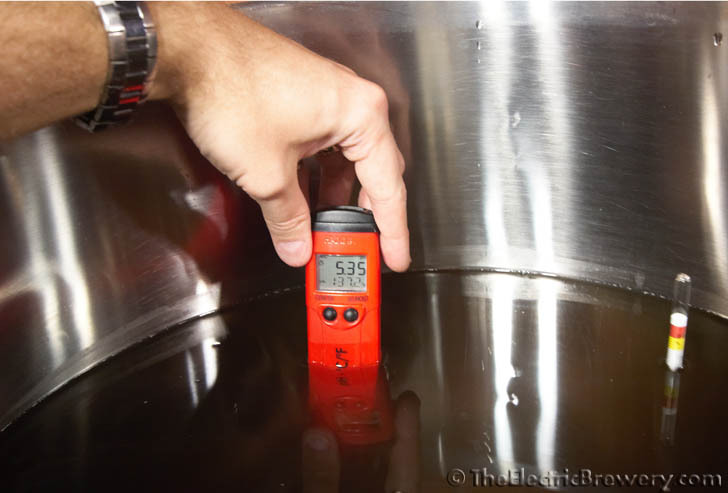 If the water is well above 140F you may want to extract a sample and wait for it to cool slightly first. (The pH meter we recommend automatically compensates for temperature but only up to 140F). To lower the pH, add some 88% lactic acid half a milliliter (mL) at a time using a 1mL (1 cc) syringe, wait a minute for the acid to recirculate and mix through the pump, and re-measure. It usually only takes us one or two milliliters at most in 10-13 gallons of sparge water to get down into the 5.6 to 5.8 range. All water is different however. Once you know how your water reacts, you'll be able to adjust it without having to measure the pH every time. We usually acidify the sparge water while the mash is proceeding. After the wort has come to a boil in Boil Kettle and the foam (called 'hot break') has subsided, add the sparge salts to the boil. 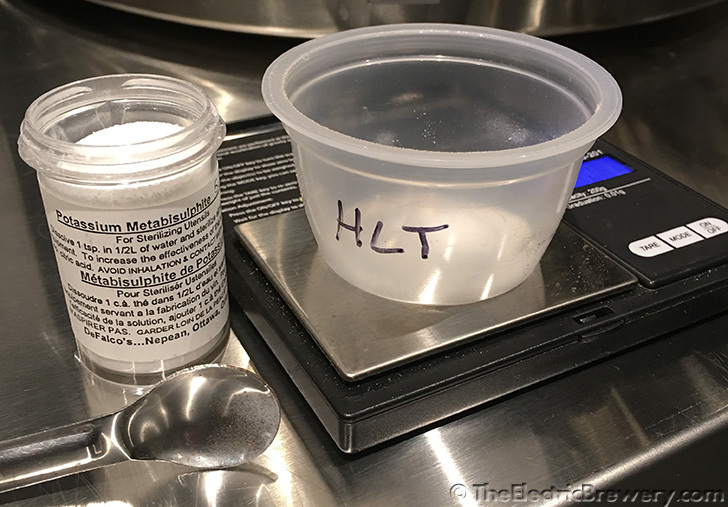 If desired, after allowing a few minutes for the salts to dissolve and mix in the boil, take a sample and allow it to cool to around 140F and measure the wort pH using the pH meter. It should be around 5.0 to 5.5 (measured at mash temperature). If it is too high you may want to consider adding some 88% lactic acid to get it down into this range. If the mash pH was ok then the wort pH is most likely fine too unless the water you use is very hard. A proper pH helps produce a good protein break during the boil which in turn helps with beer clarity and long term stability. A boil pH that is too high can also cause harsh hop bitterness. That's it! We hope you've found this water adjustment guide easy to use and that it helps you step your brewing up a notch. 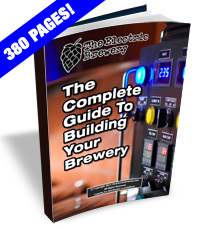 See our Brew Day: Step by Step guide for further details on how these water adjustments are incorporated in our typical brew day.